Home » Blog » Back Pain (General) » How High Should My Computer Monitor Be? 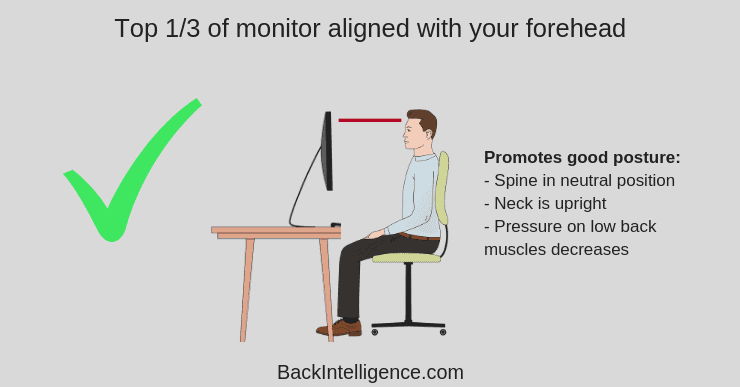 An improper monitor position can trigger back, neck and shoulder pain, as well as contribute to poor posture. And since we all come in different heights and sizes, you might be wondering how high should my computer monitor be? 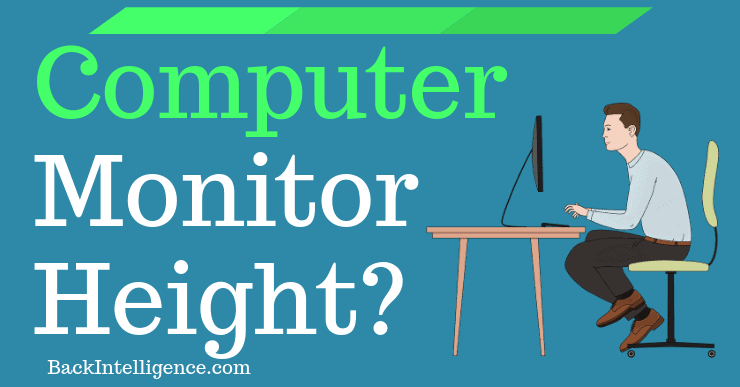 Well, there is one easy way to determine the correct ergonomic monitor height for you specifically. 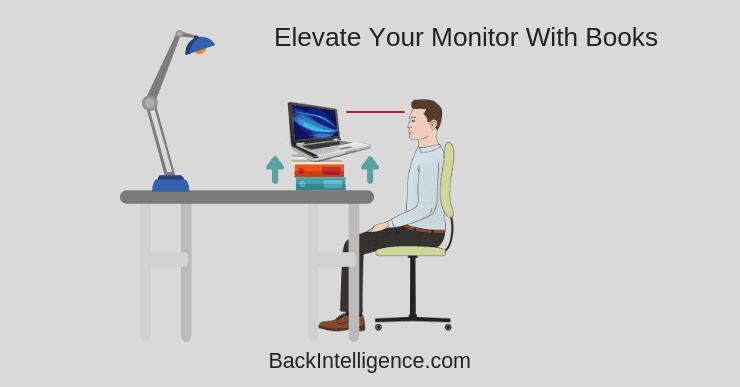 The above monitor position shows the correct monitor height where the person’s forehead is aligned with the top 1/3 of the monitor. This height helps you to not look down at your screen. Also, it helps you to keep your spine aligned in a neutral position, which puts the least amount of stress on your low back. Lastly, it ensures that your head stays stacked on top of your shoulders and avoids the neck coming forward/down – Which can really put a lot of stress on the neck and shoulder muscles. 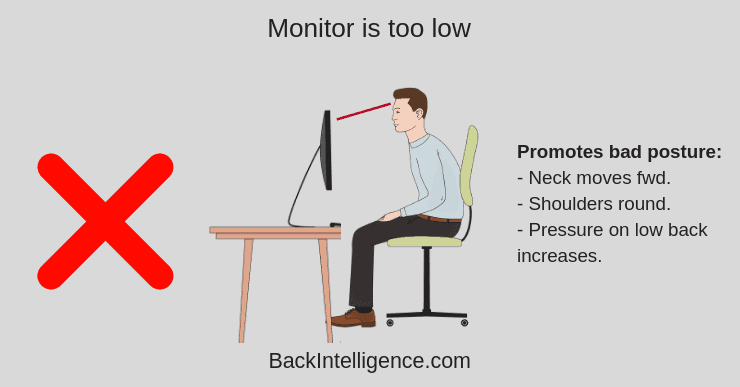 The above monitor is not aligned with the person’s forehead and therefore promotes poor posture, forcing the person to hunch down to look at his/her computer. This puts a lot of strain on the neck, shoulders and low back. How Can I Elevate My Laptop? 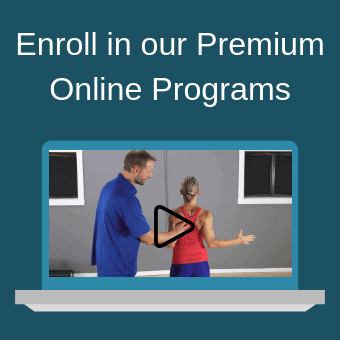 – Use lumbar cushion support to make sure your low back is supported. – Keep both feet on the floor (at roughly 90 degree angle). – Watch your head position – Make sure it’s not protruding forward. – Take breaks from sitting every 30-40 minutes to give your muscles a break. – Make sure you’re not reaching for your keyboard which can put stress on your upper trapezius muscles. – Tuck your stomach in a little bit (Draw in your navel). This will place your spine in the correct alignment. Unfortunately, this does not work if you have a lap top. Great idea, but I cannot make it work for me. Why do you say it cannot work for you? I have a laptop and the way I set it up is I have books stacked up and then I also have a laptop stand that I place on top of the books. This gets the laptop monitor high enough to my forehead. Does that make sense? How can you type when the keyboard in at your forehead level? Great question. It is recommended you get an external keyboard that connects to the laptop via bluetooth for example. Great idea, never knew they were available.